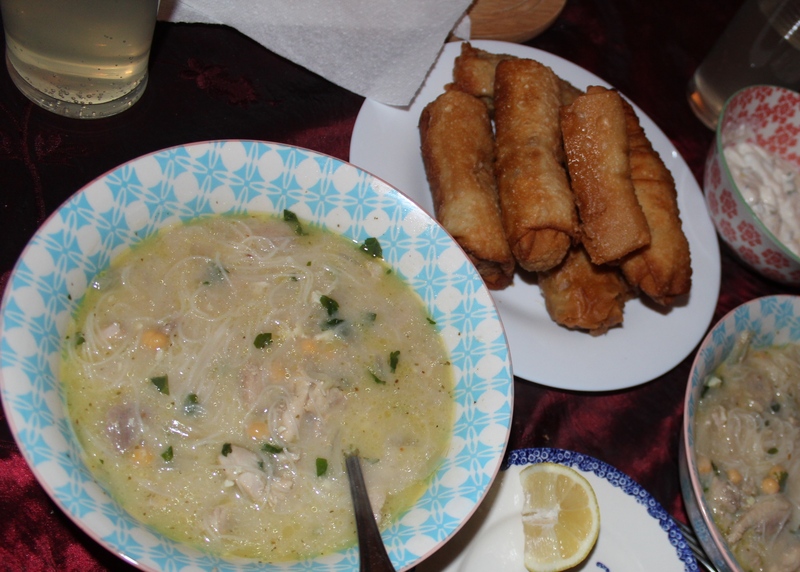 Algeria – Bourek Algéroise (Börek) and Chorba Beida / Shorba Baidha (White soup) | Around the world in Dinners! Around the world in Dinners! Algeria was a particularly yummy one, and probably the first meal that was completely different to things we’d usually eat (the soup) or I would go to the bother of cooking (The Bourek). Algeria is another country that has been influenced by many different cultures, and therefore flavours, through history, and so there were lots of possibilities! The cuisine is part of the Maghreb tradition of North-western Africa and most cooking is centered around spicy couscous which is served with long-simmered meats and stews. Looking through Algerian recipes threw up lots of lovely sweet pastry dessert-y type things as well, like Kanafeh and Asida, as well as the Berber and Ras-elHanout spiced dishes. I was momentarily horrified by a post on Algerian cuisine on the blog ‘NogarlicNoOnions’, but soon decided it was poor restaurant choice that had caused that person’s bad experiences and continued bravely with my search…. ‘White Algerian Soup’, a dish apparently often served during Ramadan, popped up a few times, and I put it in the maybe list, thinking I would do it if I found something to go with it (I always feel bad feeding Pat just soup for dinner..) and pondered making one of many Algerian bread recipes. One other recipe kept cropping up, however, and it looked delicious! ‘Bourek Algéroise’, a yummy pastry ‘cigar’ filled with beef, soft cheese and/or egg. 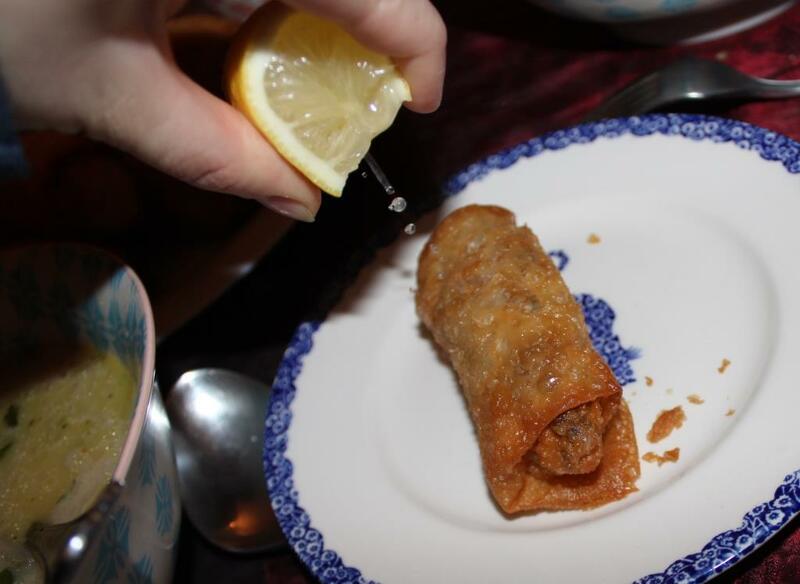 Bourek/Borek is found in many different countries with a variety of fillings, and quite frankly what’s not to love about something deep fried in pastry. This seemed a much more interesting accompaniment to the soup, and upon remembering I had some filo in the freezer the decision was made! (I since found out the two actually are often eaten together, so that’s handy). As usual I took about 4 recipes and made the ‘average’ out of them all, for example some recipes say to use rice or even Orzo pasta, but most recipes from people who either are Algerian or are married to an Algerian person said to use vermicelli, which I handily had in the cupboard due to my (in this case actually quite healthy) obsession with Vietnamese food. The Bourek recipe was a variation on one that I found on a blog called ‘The Teal Tadjine’, but when it comes to fillings you really can put whatever you want inside, lemony chicken, basil and tomato might be nice for example – but I digress! Oil, chicken stock, salt and pepper to taste. I also rather naughtily added some ‘inorfentick’ chilli flakes for added warmth. 1)Fry the onion in a big splash of olive oil, and once it’s started to soften add the chicken, if it’s still on the bone, turn up the heat to high and add some oil (help it cook through without it sticking), if it’s off and already chopped keeping it on a medium heat is fine. If you have a cinnamon stick add it now and fry with the chicken. 2)After 5-10 minutes, when it’s all nice and ‘sealed’, add a litre of chicken stock, top up with 200-500ml of water depending on how watery you like your soup, and salt and pepper if you wish. Leave it to simmer for 45 minutes ish. 4)I put the Bourek in the oven after frying to help drain some of the oil, and this is when I add the vermicelli, parsley and about 2 tsps cinnamon (I think, I just shook some into the pot for a few seconds..!). Have a taste and add more seasoning, or stock, or even water if it doesn’t seem ‘soupy’ enough. 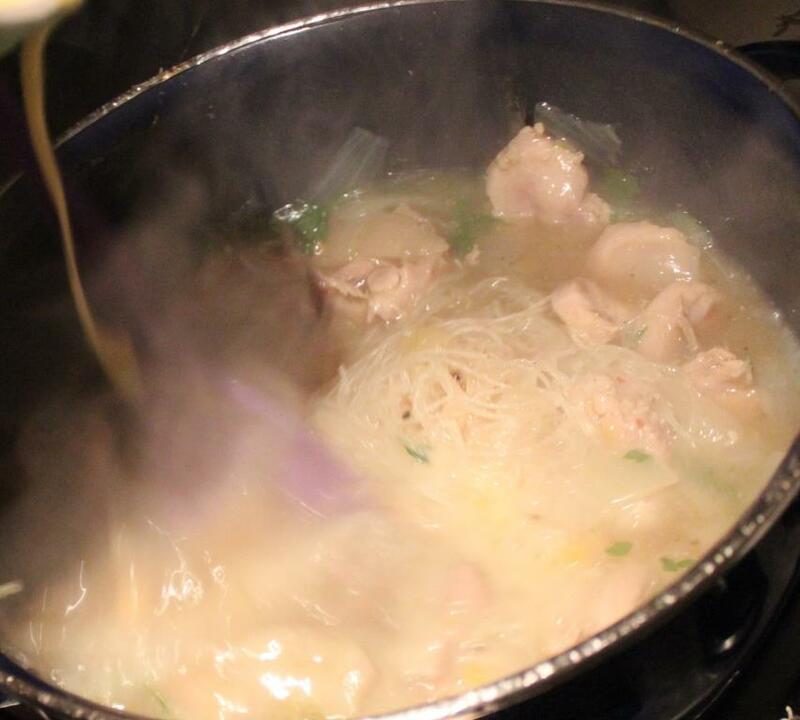 5)Whisk together the lemon juice and egg, then pour into the soup in a think stream whilst stirring FURIOUSLY. Or just briskly, depending on your mood… I got Pat to stir whilst I poured and took photos! It’ll now go ‘white’. Take off the heat and add a parsley garnish. Now it’s ready to serve with your lovely hot crispy bourek, or not, as it’s very yummy and filling by itself. Cream cheese, Boursin works very well! 1)Preheat the oven on a fan setting to 160 degrees. Fry off the mince and the diced onion or chopped spring onion (or both if you like), (I also added a little bit of celery which was v.nice) stir in the spices and harissa paste and keep stirring until browned all over. Stir in the egg and scatter in the flat leaf parsley. Fold the edges and roll it up! 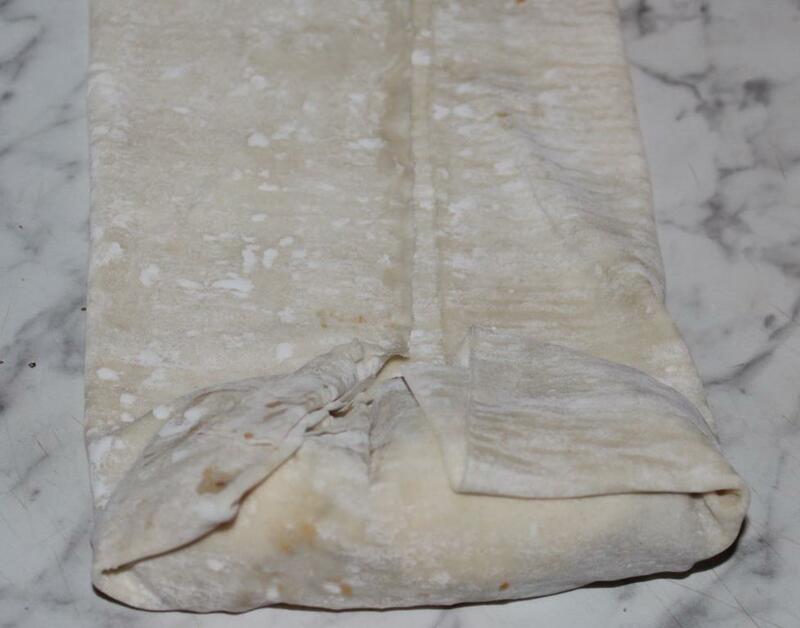 2)Take each Filo sheet and, lay flat on a clean surface. If you’d rather have smaller ‘bite-sized’ Bourek you can cut the sheets in half. 3)Smear on some cream cheese at the bottom of the sheet, put some mince on top, fold the sides over and roll up. Do this for each one, and don’t worry if some look a bit funny, you can seal the edges with a bit of water or even egg if you’re worried about them bursting. Unfortunately for me my (store bought, ahem) Filo had been freezer-burnt to the point where it had ruined the structure of the pastry, so I doubled it up to make life easier with the tearing, which you can do if you’re having tearing pastry trouble too. However it will hold more oil this way when deep-frying! 4) Heat some oil, a couple inches deep, in a pan. A Wok is ideal, in fact I think EVERYONE (well, with a kitchen and who cooks) should have a Wok. 5)When it’s the right temperature (drop a spare bit of pastry in and it should brown but not burn after around a minute) drop each Bourek in, fold side down, for a few minutes until they’re nice and bubbly and crispy on the outside. Drain off on kitchen paper, and put on a grill tray in the pre-heated oven to keep hot and allow the excess oil to drain out whilst you’re doing the finishing bits to your soup. 6)Serve with a wedge of Lemon, and your delicious Chorba Beida! I Love Writing, Beachcombing, Walking, Dartmoor, Cornwall, Cooking, Archaeology, History, Geneaology, Looking through 18-19thC Newspapers for weird stories, Folklore, Reading and Daydreaming, usually when I'm supposed to be concentrating on something important.